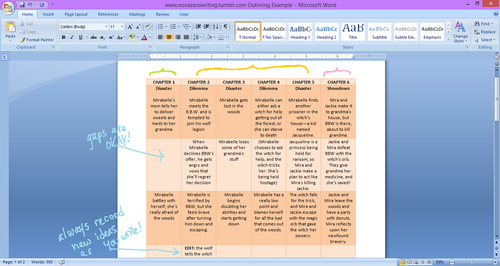 Most writers dread outlining their stories. I don’t really know why. For every good book I’ve written, there’s been a nice, meaty outline. 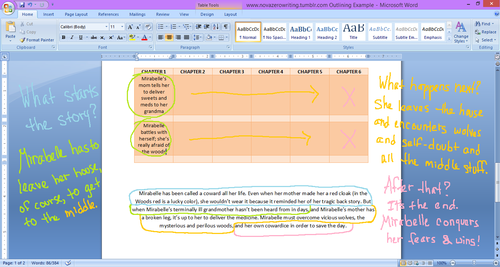 An outline consolidates every detail of your story and keeps it in a place where you can easily see the transition between scenes, chapters, and acts. My personal method has only 5 steps. 1. Create a synopsis for your story. Or just write down what you kinda want to happen. It can be pretty rough. 2. Create a table in your document. I’m using Microsoft Word 2007. 3. In a fresh document, divide your story into three acts: beginning, middle, end. 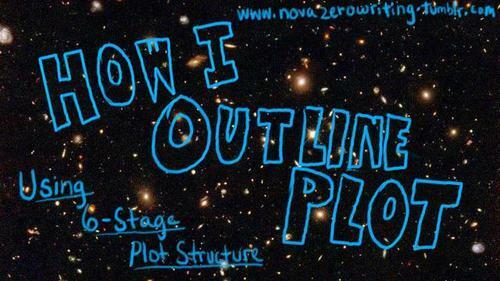 (If you’re using the 6-Stage Plot Structure, assign the parts their names.) Here, I broke it into four sections but there shouldn’t be very much back story in your actual book at all. 4. Decide what happens in your story to start it (Mirabelle leaving her house), and put that in the first square of your table (the top square circled in green.) What happens after that? 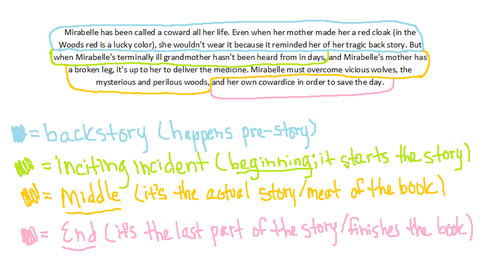 That second thing (Mirabelle hesitates) goes in the second square, (the bottom square circled in green). Pretty simple. 5. Continue filling in the squares with whatever material you have. You have gaps? No problem. You’ve got entire chapters missing? No problem. When you create a synopsis, or write your goals for a story, you tend to figure out your plot as you go. It’s normal to have gaps after that, too—filling in character sheets or just a good, ponderous shower can unlock the mystic gaps of your plot. Whenever you think of something, WRITE IT DOWN. And there you have it! Your book is outlined, and you have a temporary synopsis, too. I’m not kidding about writing down every idea you have, by the way. Whether you think it’s stupid or not, it could save your book’s life when chapter nine is just a glaring, blank space with nothing to say. I hope this was comprehensive, but if you have any questions let me know! Let’s talk about writers block Taking Steps to Strengthen Your Plot How to Write the Perfect Plot (in 2 Easy Steps) – Helping Writers Become Authors I’m coming up with ideas for stories I want to write, but whenever I try to even start writing I get overwhelmed or writers block. Any tips on how I can start writing or even layout a plot?